After researching and personally testing out The Genius Brand Genius Protein, it comes in at 3.5 out of 5 stars. There are some definite high points with this protein powder that make it stand out more than your standard protein powder on the market. This protein is versatile and I think a lot of people could potentially benefit from it. It uses a perfect 50/50 blend of Whey Protein Isolate and Micellar Casein. These are both very high quality proteins. Whey protein isolate is more of an instant release where as casein is a slow release. So you’re getting the best of both worlds in this case and getting a steady stream of aminos throughout the day (or night). This protein is great for weight loss and can be used as a meal replacement. Casein helps curb hunger and makes you feel full for longer. It’s also great for lean muscle mass and muscle recovery (especially when taken right before bed). I typically took this protein powder post workouts or before bed. It has pretty solid macros: 24g protein, 3.5g carbs, and <1g of fat. There’s no amino spiking, proprietary blends, artificial dyes, or banned substances. I like that the company is open and honest and doesn’t try to hide anything. It even lists the actual grams of each protein source, which is usually masked with “proprietary blends” in other products. I didn’t see any negative side effects and I think it’s a great price for the product you get. They also give you a 30-day, 100% satisfaction guarantee, which is much appreciated! Overall, I’m happy with this protein powder and that’s why I gave it 3.5/5 stars. This protein powder is pretty standard as far as ease of use goes. For the directions, you mix 1 serving (1 heaping scoop) with 8 ounces of cold water or milk in a glass, shaker cup, or blender. Make sure to add 4 fl. oz. of water or milk for each additional serving used. They recommend anywhere from 1-3 servings daily depending on your body type and goals. For some reason, this powder didn’t want to mix as easily as others I’ve tried. The shaker cup method still leaves some small chunks. Nothing major but just a small pet peeve of mine. I got the Genius Protein in the “Lean Coco” flavor, which I believe is the only flavor it comes in. It has a very “light” chocolate taste to it. If you’re not a fan of overly sweet, then you’ll love this. I prefer things on the sweeter side, so when I just mixed it with water it wasn’t my total favorite. But it was totally doable. Each serving size is 1 scoop (32g) and has 24g of protein, <1g of fat, and 3.5g of carbs. The carb count is mostly from sugar. It has 2 grams of natural evaporated cane sugar. The calorie amount is 110 calories for every serving. I think this is a fairly standard, solid set of macros. Genius Protein uses a 50/50 split between 2 protein sources: Whey Protein Isolate (13.5g) and Micellar Casein (13.5g). I love this combination of proteins. Both are high quality sources and they offer 2 unique benefits. Whey Protein Isolate is an instant release protein, so your body starts absorbing and using it right away. It helps to increase protein synthesis. This is great for replenishing your body post-workout. On the other hand, Micellar Casein is slowly digested, rich in calcium, and has anti-catabolic properties. It’s been shown to help boost satiety by curbing hunger and cravings while helping to control cortisol. All of this helps result in a better lean body composition. So, it’s great as a meal replacement for weight loss or at bedtime to give your body a slow, steady release of aminos to help increase recovery. This protein powder has 29% of your daily value for calcium. It’s also formulated without proprietary blends, artificial dyes, artificial flavors, artificial sweeteners, unnecessary fillers, or banned substances. I didn’t notice any negative side effects while taking The Genius Brand Genius Protein. So that’s a definite plus! This protein is fairly clean and doesn’t add in a bunch of unnecessary junk, chemicals, or fillers. This protein powder is pretty versatile so it’ll work for a number of areas. It has both whey protein and casein, so you get the best of both worlds. This protein works great for muscle recovery, weight loss, and lean body mass. It can be used as a meal replacement shake for weight loss because micellar casein helps curb hunger and cravings. This protein powder is also great as a post workout muscle-building supplement. 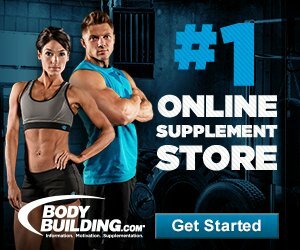 Their main website is https://supplementsmarter.com. They have all their products on there but each product has a “Buy On Amazon” link. If you want to buy something, it just sends you over to their Amazon store page. 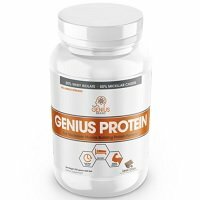 So, The Genius Brand Genius Protein costs $37.95 for 2.12 lbs. It ends up being 5.27 cents per gram of protein, which is right about average for a protein powder, maybe even a little less! And you get 30 full servings per container, which I love. Sometimes proteins only have 12-15 servings, or less, and it just goes too quick. So I think this ends up being a good value for the price! Yes! The Genius Brand offers a 30-day, 100% satisfaction guarantee. If you’re not completely satisfied with your Genius purchase for any reason, you can return it for a refund or exchange within 30 days from the ship date. I LOVE when companies stand behind their products. There’s nothing worse than getting stuck with a crappy product and being out the $$$. To buy The Genius Brand Genius Protein, click here. Ease of Use Didn’t always mix up completely, some small, gritty chunks left behind. Taste Lean Coco flavor tastes like a “light” chocolate milk.